Lobos Creek Valley located in the GGNRA (Presidio) San Francisco, CA. 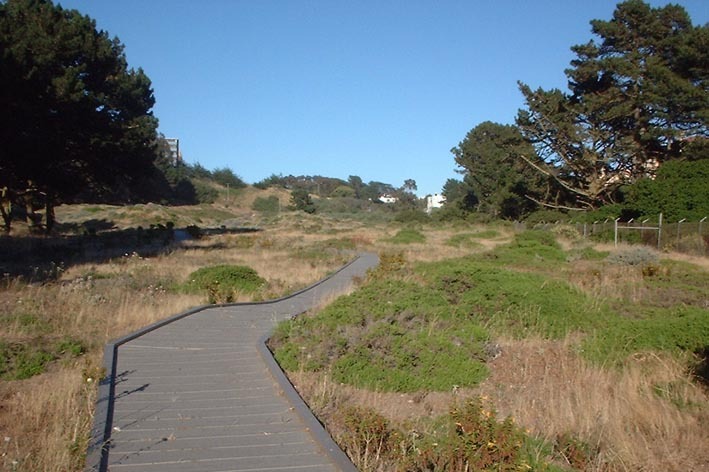 A habitat for native plants was constructed in the 1990's at Lobos Creek Valley, funded largely from mitigation funds of the 25th Ave. sewer collaspe. The original vegetation was removed, and sand was delivered to landscape over a gravel base. The cultivated area is about 13 acres (in the middle of the photo), with plans for expansion. 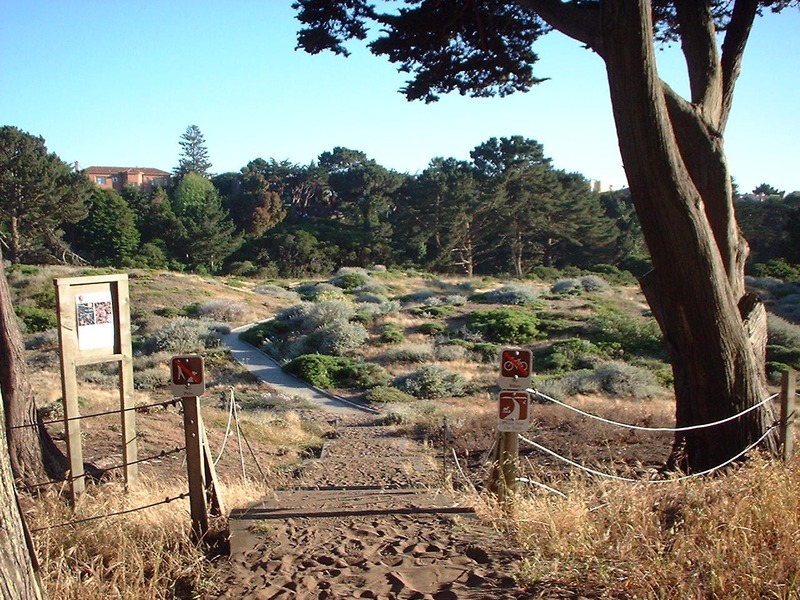 The site is bordered by Lobos Creek and Lake St. residences, Presidio Trust offices & parking lot, Camino Del Mar/Lincoln St, Monterey Cypress trees and Wherry Housing, and the empty Public Health Hospital bldg. "No Bikes. No Pets. Please Stay on the Trail." 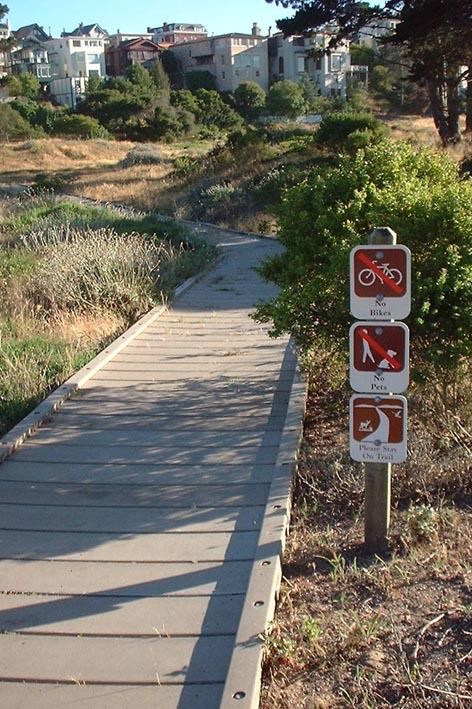 Visitors are restricted to a boardwalk. To study the exhibited native plants, one must look from the walkway. In the 1980's, there were about 250 lessengia plants at Lobos Creek Valley, later dropping to 19 plants. 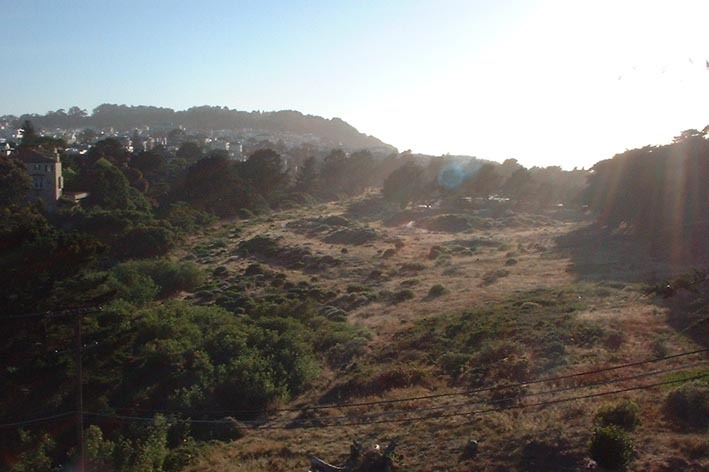 In 1995-6 Lobos Creek Valley was graded, landscaped, and seeded, with a resulting increase in lessingia. In 1998 the population peaked at 17,000,000 million. 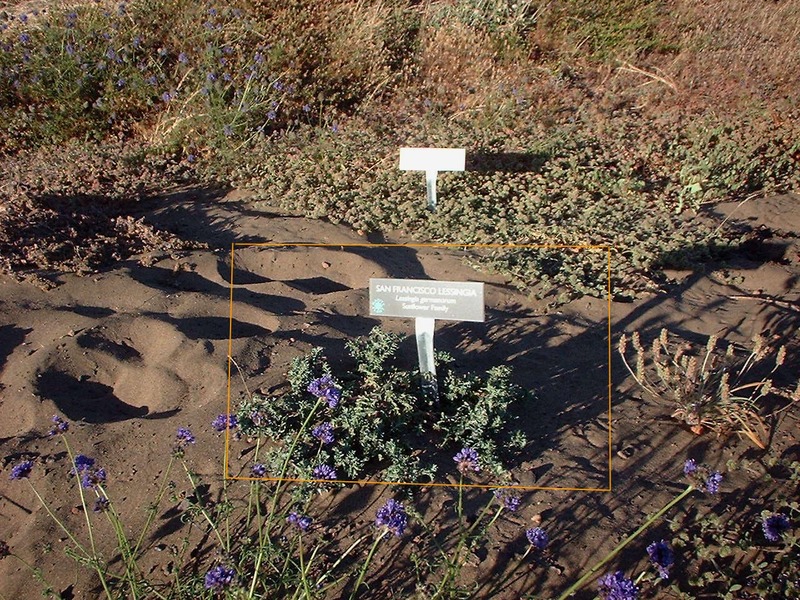 As other dune vegetation was established, the lessingia population adjusted to a more sustainable range of approximately 350,000 to 1,300,000 plants. Lessingia, an annual herb, is a member of the aster family. It grows on exposed patches of relatively immobile sand. Its height can range from a couple of inches to about 1 foot tall. During late summer through fall, small yellow flowerheads will appear. People are required to stay on the boardwalk, but ironically, Lessingia needs disturbances. After being established, moderate trampling is required for lessingia to thrive. North opening of the boardwalk, with restriction signs. 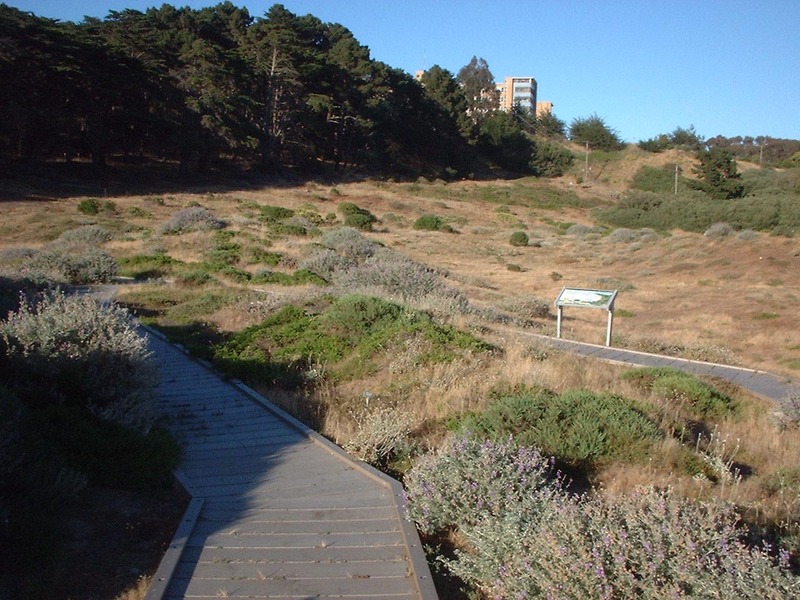 Lobos Creek Valley is an excellent exhibit of coastal dune native plants. It is peaceful and serene, a place for a solitary experience. 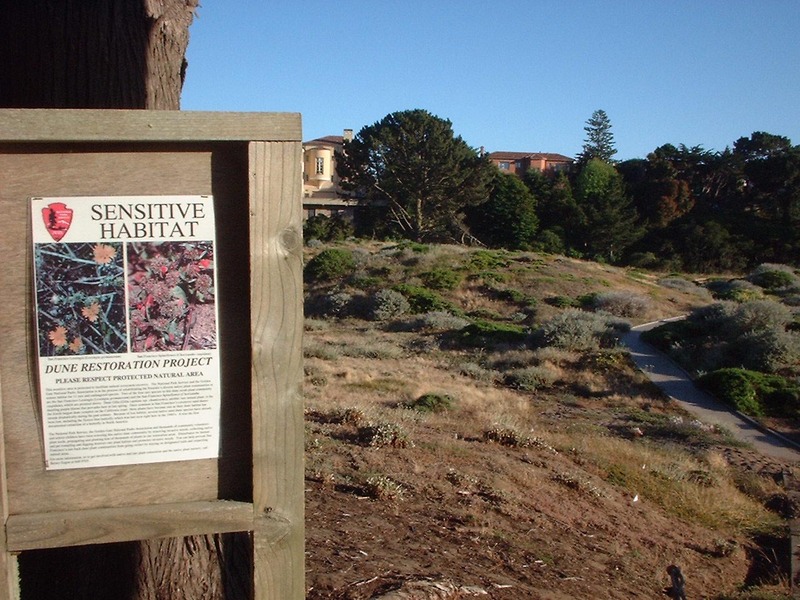 Although it is not a restoration of original habitat, it provides an opportunity for people to view native plants. In addition, the site offers the opportunity for recreational gardening, i.e. hands-on involvment with the National Parks. Because Lobos Creek Valley it is a fragmented parcel bordering a residential area, it will need constant weeding and maintenance, i.e. "Martha Steward does native plants." Scotch Broom, French Broom, Cape Ivy, and Himalyan Blackberry are some of the introduced plants that grow in the private gardens facing the habitat. In closing, although there are several benefits of Lobos Creek Valley, one must also consider the costs. Major costs of constructing these types of habitats include the removal of mature trees and loss of recreational space in a high-density urban area. Trees have high aesthetic value, improve air quality, and provide habitat to many animals. And unncessary restrictions on access to open space can recreate a backlash to environmentalism, or result in "green flight," i.e. city dwellers moving to suburban or rural areas in order to enjoy open space. This contributes to "urban sprawl" a well-documented threat to biodiversity, a threat that is unlikely to be mitigated by cultivating native plants in the city.